December 25, 2009 / admin / Comments Off on What Child is this? On this Christams day let me invite you to connect the dots between two Scriptures you might be unlikely to otherwise look at in the same sitting. The first is an prophecy from the Hebrew (Old Testament) Scriptures: “But as for you, Bethlehem Ephrathah, Too little to be among the clans of Judah, From you One will go forth for Me to be ruler in Israel. His goings forth are from long ago, From the days of eternity” (Micah 5:2). The second is Apostolic instruction from the New Testament: “He [Jesus] is before all things, and in Him all things hold together” (Colossians 1:17). 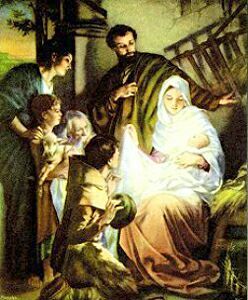 Hundreds of years before Mary and Joseph waddled into the town God had already designated the place of Messiah’s birth. At the request of Herod the Bible scholars were able to put their finger on the spot where Christ would be born (Matt. 2:4-6). While the place might have been predicable, just exactly what they would find there was not so well understood. Micah said they would find One whose “goings forth are from long ago, From the days of eternity.” In other words the newborn they would find there would be the timeless, eternal God in human flesh. The One the visitors were to celebrate was in actual fact the One who knows no beginning or end, He is “the Alpha and the Omega, the first and the last, the beginning and the end” (Rev. 22:13). Though using more theological wording, didn’t the Apostle Paul said the same thing: “He is before all things, and in Him all things Hold together” (Col. 1:17). The one hugged by Bethlehem’s barn was the Creator who had made not only that place, but all the universe. Indeed, more than His timelessness is celebrated by Paul: “in Him all things hold together.” He is, if you will, the “glue” that holds this universe together. Matter itself cannot cohere without His sustaining ministry. Were Jesus to fail for a nanosecond to sustain His constant keeping power over this creation, reality as we know it would disintegrate: the laws of nature would no longer be consistent and dependable, logic would cease, up could be down and down could be up, matter itself would explode as atomic particles spin out of their orbits! Have you ever wondered: How did Jesus sustain all things while He was just a baby? Mystery, isn’t it! While you chew on that, consider this as well: How would the truth of Jesus’ sustaining power of the universe help someone you know today? It all makes that great Christmas carol so much more wonderful, doesn’t it? It asks the question that everyone at the scene of Jesus’ birth ought to have been asking. It asks the question everyone, everywhere in all ages ought to ask: What Child Is This? Why not find some quiet place and to give yourself some space for an extended time of worship before the Son of God? Praise Him for His sustaining grace in our world and in your life. Then present to Jesus the confusing and chaotic circumstances you face and ask Him to make sense of them. Then be at rest in your soul.